A cell-shading waist up for Taylor of their OC Ronnie. I love his eyes! I really like his character concept! 1. This man is gorgeous. 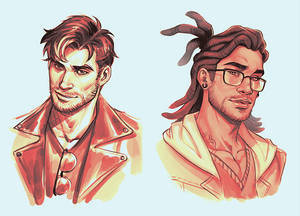 You are really good at drawing gorgeous men. I love his hair. 2. Are your commissions still open and where can I find them? I will save this for later use. Thank you! Looks awesome! Poor guy's eyes, though, ouch! I LOVE how you shaded his hair ? ?